In a small bowl, combine ranch seasoning mix, sour cream, and milk. Cover and chill at least 1 hour. Spray grill rack with nonstick nonflammable cooking spray. Preheat grill to medium high heat (350 to 400 degree). In a large bowl or zip top plastic freezer bag, combine buffalo seasoning mix and vegetable oil. Add chicken wings to boel or bag; toss to coat. Cover or seal, and let stand for 10 minutes. Remove wings from marinade discarding marinade. Grill wings, covered with grill lid, turning often, for 20 to 25 minutes or until done. 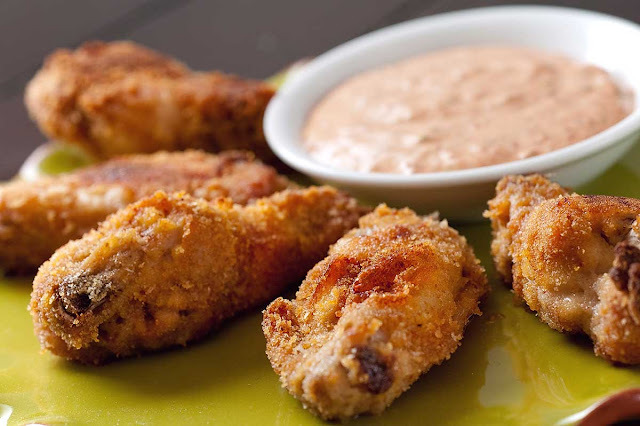 Serve chicken wings with sour cream mixture. End.